Marshaling an impressive range of original research from archives in the Americas and Europe, the authors show how ordinary working people led dozens of rebellions on both sides of the North Atlantic. The rulers of the day called the multiethnic rebels a ’hydra’ and brutally suppressed their risings, yet some of their ideas fueled the age of revolution. Others, hidden from history and recovered here, have much to teach us about our common humanity. “What would the world look like had the levelers, the diggers, the ranters, the slaves, the castaways, the Maroons, the Gypsies, the Indians, the Amazons, the Anabaptists, the pirates . . . won? Peter Linebaugh and Marcus Rediker show us what could have been by exhuming the revolutionary dreams and rebellious actions of the first modern proletariat, whose stories—until now—were lost at sea. They have recovered a sunken treasure chest of history and historical possibility and spun these lost gems into a swashbuckling narrative full of labor, love, imagination, and startling beauty.” —Robin D. G. Kelley, author of Yo’ Mama’s Disfunktional! With Rachel Carson, let us first look from above: “The permanent currents of the ocean are, in a way, the most majestic of her phenomena. Reflecting upon them, our minds are at once taken out from the earth so that we can regard, as from another planet, the spinning of the globe, the winds that deeply trouble its surface or gently encompass it, and the influence of the sun and moon. For all these cosmic forces are closely linked with the great currents of the ocean, earning for them the adjective I like best of all those applied to them--the planetary currents.” The planetary currents of the North Atlantic are circular. Europeans pass by Africa to the Caribbean and then to North America. The Gulf Stream then at three knots moves north to the Labrador and Arctic currents, which move eastward, as the North Atlantic Drift, to temper the climates of northwestern Europe. At Land’s End, the westward foot of England, break waves whose origins lie off the stormy coast of Newfoundland. Some of these breakers may even be traced to the coast of Florida and the West Indies. For centuries fishermen on the lonely shores of Ireland have been able to interpret these long Atlantic swells. The power of an ocean wave is directly related to the speed and duration of the wind that sets it in motion, and to the “length of its fetch,” or the distance from its point of origin. The longer the fetch, the greater the wave. Nothing can stop these long waves. They become visible only at the end, when they rise and break; for most of their fetch the surface of the ocean is undisturbed. In 1769, Postmaster General Benjamin Franklin noted that packets from Falmouth took about two weeks longer to reach New York than merchant ships took to sail from Rhode Island to London. In talking to Nantucket whalers, he learned about the Gulf Stream: the fishermen and the whales kept out of it, while the English captains stemmed the current, “too wise to be counselled by simple American fishermen.” He drew up some “Maritime Observations” in 1786, and with these the chart of the Gulf Stream was published in America. The circular transmission of human experience from Europe to Africa to the Americas and back again corresponded to the same cosmic forces that set the Atlantic currents in motion, and in the seventeenth and eighteenth centuries, the merchants, manufacturers, planters, and royal officials of northwestern Europe followed these currents, building trade routes, colonies, and a new transatlantic economy. They organized workers from Europe, Africa, and the Americas to produce and transport bullion, furs, fish, tobacco, sugar, and manufactures. It was a labor of Herculean proportions, as they themselves repeatedly explained. The classically educated architects of the Atlantic economy found in Hercules--the mythical hero of the ancients who achieved immortality by performing twelve labors--a symbol of power and order. For inspiration they looked to the Greeks, for whom Hercules was a unifier of the centralized territorial state, and to the Romans, for whom he signified vast imperial ambition. The labors of Hercules symbolized economic development: the clearing of land, the draining of swamps, and the development of agriculture, as well as the domestication of livestock, the establishment of commerce, and the introduction of technology. Rulers placed the image of Hercules on money and seals, in pictures, sculptures, and palaces, and on arches of triumph. Among English royalty, William III, George I, and George II’s brother, the “Butcher of Culloden,” all fancied themselves Hercules.1 John Adams, for his part, proposed in 1776 that “The Judgment of Hercules” be the seal for the new United States of America.2 The hero represented progress: Giambattista Vico, the philosopher of Naples, used Hercules to develop the stadial theory of history, while Francis Bacon, philosopher and politician, cited him to advance modern science and to suggest that capitalism was very nearly divine. These same rulers found in the many-headed hydra an antithetical symbol of disorder and resistance, a powerful threat to the building of state, empire, and capitalism. The second labor of Hercules was the destruction of the venomous hydra of Lerna. The creature, born of Typhon (a tempest or hurricane) and Echidna (half woman, half snake), was one in a brood of monsters that included Cerberus, the three-headed dog, Chimera, the lion-headed goat with a snake’s tail, Geryon, the triple-bodied giant, and Sphinx, the woman with a lion’s body. When Hercules lopped off one of the hydra’s heads, two new ones grew in its place. With the help of his nephew Iolaus, he eventually killed the monster by cutting off a central head and cauterizing the stump with a flaming branch. He then dipped his arrows in the gall of the slain beast, which gave his projectiles fatal power and allowed him to complete his labors. From the beginning of English colonial expansion in the early seventeenth century through the metropolitan industrialization of the early nineteenth, rulers referred to the Hercules-hydra myth to describe the difficulty of imposing order on increasingly global systems of labor. They variously designated dispossessed commoners, transported felons, indentured servants, religious radicals, pirates, urban laborers, soldiers, sailors, and African slaves as the numerous, ever-changing heads of the monster. But the heads, though originally brought into productive combination by their Herculean rulers, soon developed among themselves new forms of cooperation against those rulers, from mutinies and strikes to riots and insurrections and revolution. Like the commodities they produced, their experience circulated with the planetary currents around the Atlantic, often eastward, from American plantations, Irish commons, and deep-sea vessels back to the metropoles of Europe. There you must fight blindly an invisible enemy Who shoots you down like ducks in the swamps. Even if an army of ten thousand men were gathered, with The courage and strategy of Caesar and Eugene, They’d find their work cut out for them, destroying a Hydra’s growth Which even Alcides [Hercules] would try to avoid. Writing to and for other Europeans assumed to be sympathetic with the project of conquest, Mauricius cast himself and other colonizers as Hercules, and the fugitive bondspeople who challenged slavery as the hydra. Andrew Ure, the Oxford philosopher of manufactures, found the myth to be useful as he surveyed the struggles of industrial England in 1835. After a strike among spinners in Stayleybridge, Lancashire, he employed Hercules and his rescue of Prometheus, with his delivery of fire and technology to mankind, to argue for the implementation of the self-acting mule, a new machine “with the thought, feeling, and tact of the experienced workman.” This new “Herculean prodigy” had “strangled the Hydra of misrule”; it was a “creation destined to restore order among the industrious classes, and to confirm to Great Britain the empire of art.” Here again, Ure saw himself and other manufacturers as Hercules, and the industrial workers who challenged their authority as the hydra. When the Puritan prelate Cotton Mather published his history of Christianity in America in 1702, he entitled his second chapter, on the antinomian controversy of 1638, “Hydra Decapita.” “The church of God had not long been in this wilderness, before the dragon cast forth several floods to devour it,” he wrote. The theological struggle of “works” against “grace” subverted “all peaceable order.” The controversy raised suspicions against religious and political officials, prevented an expedition against the Pequot Indians, confused the drawing of town lots, and made particular appeals to women. For Mather, the Puritan elders were Hercules, while the hydra consisted of the antinomians who questioned the authority of minister and magistrate, the expansion of empire, the definition of private property, and the subordination of women. It would be a mistake to see the myth of Hercules and the hydra as merely an ornament of state, a classical trope in speeches, a decoration of ceremonial dress, or a mark of classical learning. Francis Bacon, for example, used it to lay the intellectual basis for the biological doctrine of monstrosity and for the justifications of murder, which themselves have a semantics of Latin euphemism--debellation, extirpation, trucidation, extermination, liquidation, annihilation, extinction. To cite the myth was not simply to employ a figure of speech or even a concept of analytic understanding; it was to impose a curse and a death sentence, as we will show. 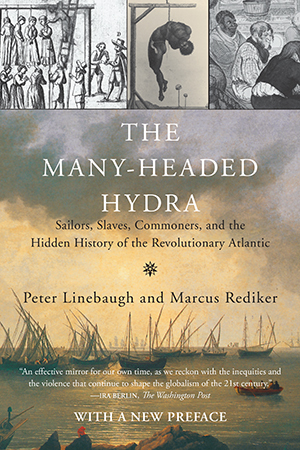 If the hydra myth expressed the fear and justified the violence of the ruling classes, helping them to build a new order of conquest and expropriation, of gallows and executioners, of plantations, ships, and factories, it suggested something quite different to us as historians--namely, a hypothesis. The hydra became a means of exploring multiplicity, movement, and connection, the long waves and planetary currents of humanity. The multiplicity was indicated, as it were, in silhouette in the multitudes who gathered at the market, in the fields, on the piers and the ships, on the plantations, upon the battlefields. The power of numbers was expanded by movement, as the hydra journeyed and voyaged or was banished or dispersed in diaspora, carried by the winds and the waves beyond the boundaries of the nation-state. Sailors, pilots, felons, lovers, translators, musicians, mobile workers of all kinds made new and unexpected connections, which variously appeared to be accidental, contingent, transient, even miraculous. Our book looks from below. We have attempted to recover some of the lost history of the multiethnic class that was essential to the rise of capitalism and the modern, global economy. The historic invisibility of many of the book’s subjects owes much to the repression originally visited upon them: the violence of the stake, the chopping block, the gallows, and the shackles of a ship’s dark hold. It also owes much to the violence of abstraction in the writing of history, the severity of history that has long been the captive of the nation-state, which remains in most studies the largely unquestioned framework of analysis. This is a book about connections that have, over the centuries, usually been denied, ignored, or simply not seen, but that nonetheless profoundly shaped the history of the world in which we all of us live and die.